I'm back again with another tagged post. I'm loving these at the minute as it forces me to really examine my products and realise that somethings work for me no matter what the price is (high street has some real gems). Thanks to Amy from A Little Boat Sailing and Megan from Little Miss Average for tagging me! Essential, Beneficial, Fast, Balanced, Invigorating. Dry with a slightly oily t-zone and prone to dehydration. I have slight pigmentation across my cheeks and around my nose as well as a tiny cluster of light spider veins on my right cheek. Most people don't notice this, but as I know it's there I get very self conscious. Without doubt it's the Hydraluron that I picked up last week. I've only been using it a few days, but I've already felt such a massive difference in the texture and look of my skin. It's really helping my moisturiser do it job! That paired with my double cleanse routine, I've got it pretty well covered. I rarely get spots, as I have dry skin and really look after it well. On the days when I do have reach for a spot remedy, it's usually Origins Super Spot Remover. That little pot does the world of good! A generous helping of that places over it and the next day it's already miles better. It's very drying, so make sure to use a hydrating moisturiser afterward. Nay! I used to use them out of pure laziness, but getting into beauty made me realise how much damage I was doing to my skin. The alcohol alone in the cheap wipes makes me shudder and there was not even a whisper of a cleanser after. I'm a little more clued up now and would only ever use a non-alcoholic face wipe in a real pinch. I absolutely adore toner! I wasn't massively sold on toner even just a few months back as I didn't have massive pores and felt that this was all toner claims to solve. Why spend money on a skincare product that I didn't really need? It wasn't until I found out that it's also to help balance skin conditions, controls oil generation and regulates the elasticity of the skins pores that I took note. Well, at least my Dr. Hauschka Facial Toner does all of this and at £14 for a heavenly scented spray bottle, you really can't go wrong! It's so handy because you don't have to put it onto a cotton pad, just spray directly onto the face. Skincare, every day of the week. I'm the kind of girl who can go full weeks without putting any makeup on because I'm having 'a nice skin day' and this is purely down to the type of routine I have. My Origins Make A Difference Night Skin Rejuvenating Gel-Cream is one of my higher priced moisturisers but is utterly nourishing for the evening. Though I will say that you don't have to buy the expensive brands to achieve great skin, you just have to be savvy about it. I've not come across many unusual skincare products. I suppose a slightly odd one would be a gin and tonic facial that was offered at a local spa. Not entirely sure where they were going with it, but it did feel nice! You're in a French pharmacy and can only pick up one item - what is it? Most likely La Roche Posay Serozinc. I've heard such amazing things about it and it's one of the only items that they don't have on sale here. Being able to spray it on appeals to my lazy side! Drink as much water as you can. On the weeks I've actually done my 8 glasses a day, I do notice a much healthier glow to my skin and feel like I don't have to crack out the industrial strength moisturiser for my constantly parched skin! I also can't recommend the double cleanse enough, as you will have noticed in my answers. Since doing it, my skin looks entirely different! Removing that surface layer and then going in again, properly massaging into the pores gets all the clogged up dirt from below out. Don't worry if you breakout a little, this is natural and completely normal as it's all the nasty stuff making its way out! Let me know if you attempt this tag, and send me a tweet if you do! I did this tag, I loved your answers! Give it a go, it's such fun to do. 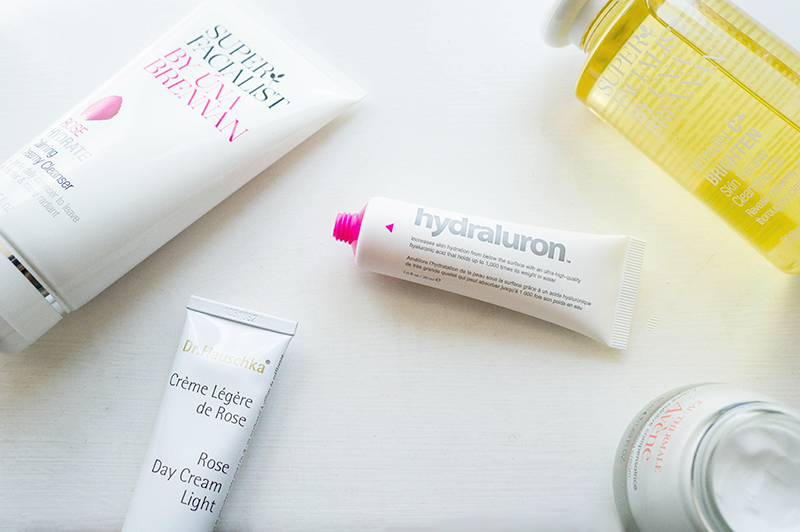 Hydraluron is worth the investment, I wish I'd bought it sooner. It's such a great price when it lasts ages. £11 seems steep when you see the size, but you need the smallest amount and I've had this well over a year and not made a dent in it. I love tags, such a nice way to break up reviews and to have a little fun, hehe. Please do Laa, I'd love to read them. Love you, girl! I didn't even think about make-up wipes being bad for skin! I suffer from sensitive/combination skin and acne so really struggle with beauty. I'm religious about taking my make-up off, but use Simple wipes. What remover would you recommend? The wipes are getting binned! Simple wipes aren't as bad as they are alcohol-free (I only allow my boyfriend to use these). But, you're only removing the makeup, not the ingrained dirt under the skin, so I'd recommend something that's going to work for your sensitive skin while combating your acne, etc. I would say invest in Pai Camellia & Rose Gentle Hydrating Cleanser, it's for all skin types and especially made for sensitive skin. So you can use the wipes to take off surface makeup, then go in with the cleanser. The bonus is that is comes with a muslin cloth so you can wipe it all off with a little warm water after. I hope this helps you, if you need any more advice, I'd be happy to help if you want to drop me an email. Thanks Rachael, I'm just checking yours out now! Water makes such a difference. I'm not bad about it, but not as dedicated as Kate, and her skin is brilliant. Mine is pretty much prone to being oily, save for the places I shave. So it's acne wash in the shower, then Neutrogena post shave lotion, and that balances everything out nicely. I've taken to using shaving oil recently, and it's so much easier on you than anything else I've used. Oh it really does, I can tell when my skin is parched that I've been silly not drinking enough water. Hello there :) this was a helpful tag haha I do so badly at taking care of my skin, it's awful! I'm glad I discovered your blog and also your youtube channel and am going to follow/subscribe instantly! :) i started off on youtube as well, maybe we can stay in touch there, It's quite lonely on youtube at the beginning haha hope you're having a wonderful day! I will check your blog and channel out now. I agree, drinking enough water really makes a difference! I immediately notice a difference on the days that I skimp on my water intake. It really does! I honestly can't believe it took me to long to get it when I know that so many people raves about it. Yay you did it :) Sorry I've only just got to commenting back, I'm so behind!